According to the Chinese folklore, in 2737 BC. Chinese emperor Ksan Nung found the tea beverage while he was drinking a glass of hot water. The wind dropped into the glass a leaf from the tree under which the emperor was sitting. He found the concoction to be a great improvement from plain boiling water. And after this he gave orders for growing teas. Today, this drink has hundreds of species in different genera and is a popular thirst quencher and the most commonly consumed beverage in the world after water. The Chinese and Japanese have a habit of drinking the beverage in the afternoon and the British people drink several cups of it every day. Tea-drinking is national pastime in India, where the biggest production of the plants is. The more processing tea leaves undergo, the darker they become. Green tea, the least processed tea, is simply steamed quickly. Black and red teas are partially dried, crushed and fermented. Green tea herb is especially liked by people from Far East, and the semi-fermented teas, especially the oolong (black dragon) by people of south China and Taiwan. Black teas are consumed relatively more in Europe. Its strong, rich and brisk flavor that energizes both body and mind is makes it an ideal healthy althernative to coffee. Moreover, a cup of tea contains an average of 40mg of caffeine, compared to 85mg as found in a cup of freshly brewed coffee. Beyond its taste for enjoyment, tea is a health food packed with various health perks. It contains anti-cancer polyphenols, essential oils, some vitamins (E and some from B group) and minerals, including a high percent of zinc which is important for pregnant women. Tea has long since been associated with nearly every meal in many countries and accepted as a healthy supplemental drink. And over the last few years, as people become more sophisticated with tea-drinking and savvy with the different tea types and are sold on the fact that regularly drinking tea is helpful in protecting the body from diseases, more and tea houses have sprung up to cater to these tea consumers. Furthermore, scientific studies suggesting that medical benefits of tea can improve a person's health have sparked new interest in tea as an alternative drink. 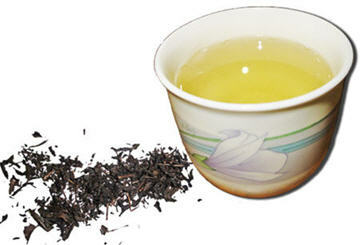 The heart-health and cancer-preventive benefits of black and green teas are well-publicized. Scientists point to a natural class of antioxidants called flavonoids found in many natural plant-derived foods, including tea. White tea, made from the tender, infant bud of the plant, undergoes virtually no processing, is very popular right now because people have found out from the media that it has the most antioxidants than any other tea. The antioxidants in tea help remove the body of molecules called free radicals, which are body damaging by-products from pollution and the natural aging process. Free radicals in the body's cells are very unstable and tend to react negatively with other important molecules like DNA, causing malfunctions and damages on the cellular level. The destruction of these free radicals paves the way for many diseases including cancer. It is also believed that antioxidants have positive effects on dental health. Studies showed that rinsing the mouth with black or green tea may prevent cavities and gum disease. The antioxidants in black tea inhibit the growth of bacteria that promotes cavities and affect their ability to attach to tooth surfaces. Research suggests that tea may also increase bone-mineral density and drinking tea regularly for years may produce stronger bones. It also indicates that older women who are tea drinkers are less likely to develop rheumatoid arthritis than those who do not drink tea. Tea drinkers may be surprised to learn another health benefit of tea: blood pressure control. Drinking a half-cup of green or oolong tea per day could reduce a person's risk of high blood pressure according to some studies. 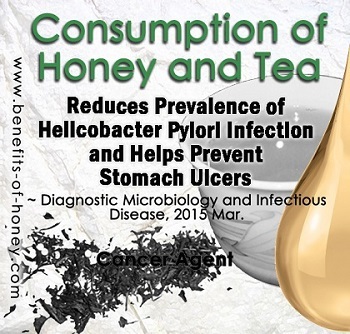 Many people use honey to naturally sweeten tea in replacement of table sugar due to its associated health benefits. A good source of carbohydrates, natural pure honey sweetens with no additives or preservatives. Because of its composition, pure honey has a lesser effect on glucose and insulin levels. Personally I am very fascinated and intrigued by how the hundreds of varieties of honey can mix and match with these tea blends to customize and suit personal moods and preferences in taste. I cannot imagine the kind of exciting impact these multiple combinations would have on our sensory experiences, and not to mention the natural health benefits inherent in both products. We don't have to be a connoisseur to experiment the various honey-tea combinations. It's fun and easy, just incorporate it into each morning's breakfast, afternoon snack, or family party. For instance, avocado honey variety can go with Earl Grey tea, and clover honey with either lemon or mint tea for a unique taste, Tupelo honey variety with Jasmine tea, and Eucalyptus honey with Irish Breakfast tea. Blueberry honey's pronounced taste adds zest to mild tea blends such as Earl Grey or English Breakfast. Orange blossom honey, one of the most versatile honey varieties adds a new dimension to most tea blends. Some think it's best with black teas such as Ceylon and Darjeeling. Teas with strong distinctive tastes, such as Jasmine or Apple cinnamon, go well with mild-flavoured Alfalfa honey. Sage honey, yet another mild variety complements intense tea flavours including orange spice, lemon, and mint. So, why not consider including 1 or 2 cups of tea as a healthy part of your daily diet. The flavour possibilities are endless and perhaps limited only by your imagination, especially now there are convenient honey sticks that come in all sorts of fruity and exotic flavours. Lastly, remember, when adding honey into tea, wait till it's not too hot to avoid destroying its natural goodness. 2. Enjoy a cup of warm ginger tea and gain from its host of medicinal benefits. More in: Honey Ginger Remedy. 3. Tie Guan Yin Honey Tea is an ancient traditional recipe for treating abdominal disorders, nourishing the stomach, removing heatiness, as well as curing cough: Have You Ever Heard of Honey Tie Guan Yin Tea?. End of Perfect Match of Tea and Honey. Go to "Suggested Uses of Honey Varieties in Cooking".